GET STARTED: Use the links above to download the app for your iPhone or Android. 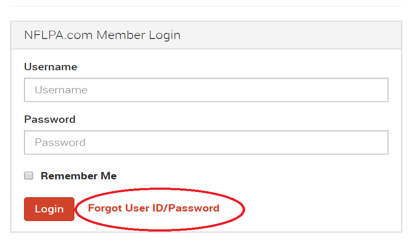 If you have trouble logging in, use the Forgot User ID/ Password link. If that is unsuccessful, contact Former Player Services as you might need to activate your account. POST/VIEW CONTENT: Post ideas or topics for others to discuss on the Forum using the plus icon in the top right corner. You can tailor your Forum to only show the comments of the players you are Following, the most Popular, or those from players Near Me by choosing from the headings at the top of the page. CONNECT WITH OTHER FORMER PLAYERS: While in the Forum, select the Community icon (above Community) to see a list of players using the app. Using the magnifying glass icon, you can search for players using names, cities, and states. Clicking on a user's profile will allow you to follow them or send them a direct message (note: make sure your notifications are set to alert you when you receive messages). 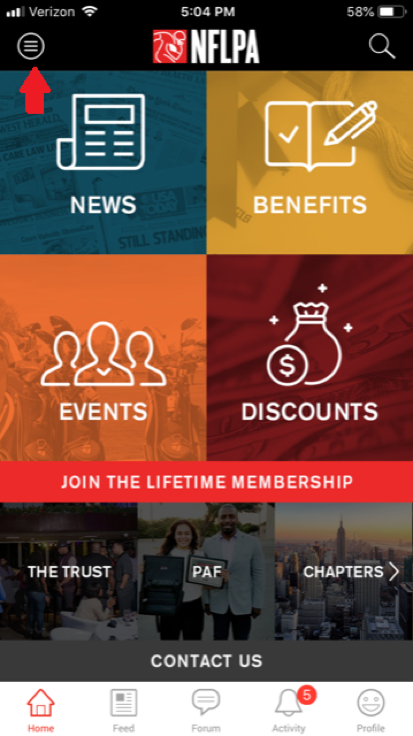 FIND RESOURCES AND BENEFITS: Once you log in, you will be able to access info you can also see on NFLPA.com, such as Player News, Benefits, Events, Discounts, Chapters, PAF, and The Trust. You can also select the "Hamburger Menu" (three lined icon on the top left), to sort your content by topics including "Health" and "Career Transition." RENEW YOUR NFLPA MEMBERSHIP: You can now update your membership to receive your membership card or renewal sticker through the app. Simply click Contact Us at the bottom of the home screen, then the Profile icon (a gray head and shoulders), Profile, and then "My Profile is up to date" once your contact information is correct. Please allow 4-6 weeks after completing that process for your card or sticker to arrive. 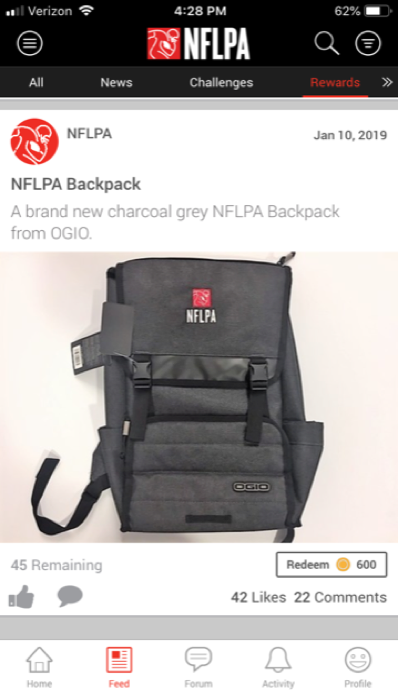 EARN COINS FOR NFLPA SWAG: Almost everything you do on the app, from logging in to posting topics to reading articles to commenting on posts, earns you coins to redeem for NFLPA merchandise. Go to Feed and then select Rewards to see the great prizes currently available including backpacks, shirts, car decals and more! LET THE GAMES BEGIN: The NFLPA will continue to add quizzes, polls, and videos to the Feed that you can complete to earn coins. If you attend an NFLPA Meet Up or Event, be sure to look in Challenges to earn additional points for checking in. 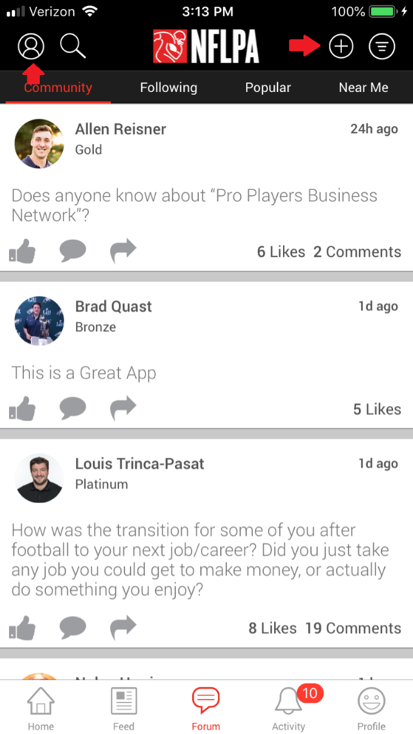 If you have questions, please call the NFLPA Former Player Services Department at 800-372-2000 or hit us up on the app!